Last autumn was long. Usually Chicago has about two weeks of spring or fall before summer or winter starts. Last autumn was long enough for the maple leaves to turn brilliantly red. I planted a few maple trees in my yard years ago but failed; they turn yellow instead of red. Luckily, there are some beautiful maple trees in my neighborhood to enjoy. I used to stop and stare at the luminous orange leaves for a long time in the alley on my way home. Luckily there aren’t too many cars in our alley. A Japanese maple tree that we planted after Allen built his koi pond during his high school years however did grow and now has contributed to the good scenery in our yard. We have a pattern in our line called Maple Fall; it was introduced in 1993, and it is probably the oldest pattern in our line. It was this pattern that put Brentano in the black after its inception in 1990. I used to wear many hats at work and only had time to design after work hours and on weekends. I drew this pattern at my kitchen table looking out at the maple leaves through the bamboo shades. The word “Fall” is intended to depict the leaf-laden branches cascading down like waterfalls. 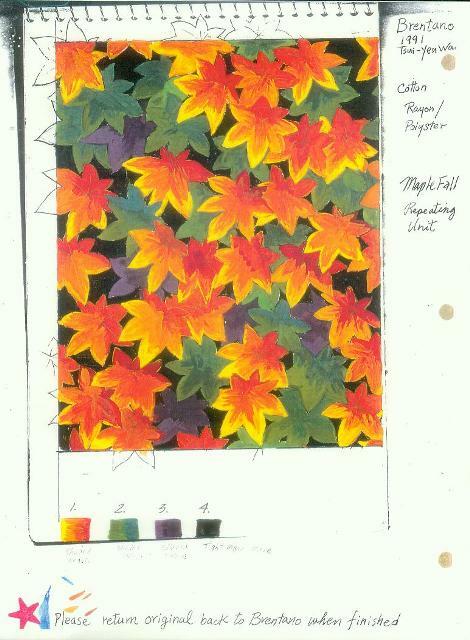 I was quite infatuated by the idea of maple leaves in abundance which eventually turned this concept into a fabric design. You are currently reading Maple and Koi at Woven-Words.